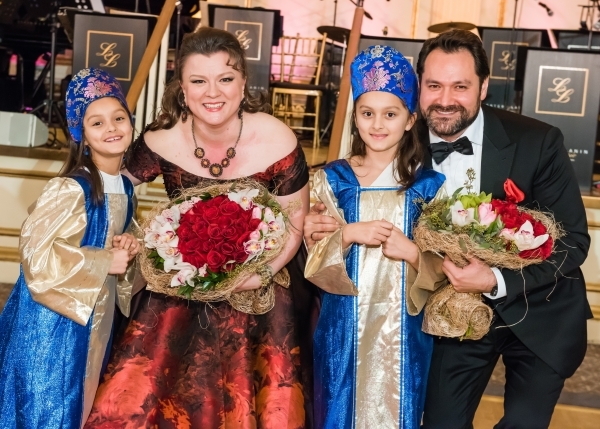 The 54th Annual Petroushka Ball took place on February 8th 2019 at the legendary Plaza Hotel and featured a stunning performance by Nadine Sierra, soprano and Francesco Demuro, tenor, who appeared by kind permission of the Metropolitan Opera. It has been 19 years since RCWS organized our first Yelka, a modest Russian Christmas and New Year Party in Moscow for disadvantaged children. Today, over 1,000 children annually participate in RCWS’s Yelka festivities and are treated to a Christmas show and presents. This past December, over 1,000 children traveled great distances to participate in the 19th annual Yelka event at the Cathedral of Christ the Savior’s concert hall in Moscow, to see the holiday show “Master of Winter Forest,” and to receive a gift. Last December, RCWS personnel and volunteers, together with “Ded Moroz” (Russian Santa Claus), visited the Orphanage in Shatura, which houses 150 children with special needs, as well as over 100 little patients at the Moscow Center for Maxillofacial Surgery and the Institute of Rheumatology in Moscow to distribute gifts and bring some magic to their holiday. RCWS has made it a tradition to gather our scholarship recipients for a reunion every summer. This year’s Pskov students reunion took place on July 12th in Pleskov, a retreat overlooking the Pskov Lake, and was covered by a local newspaper. This year, Michael Narinsky, representing the young supporters and the Russian MBA Club in NYC, joined the meeting online and conducted a workshop for the students. In addition to the diploma ceremony, students had a chance to engage in sport activities: swimming, playing beach volleyball, biking. After lunch, the participants shared their college experiences and thanked sponsors – RCWS supporters. During the 2017-2018 academic year, 40 RCWS scholarship recipients were attending colleges and universities in Pskov region. As of today, 46 students from Pskov region completed their studies, received diplomas and found employment. Since the inception of the RCWS scholarship program 15 years ago, the number of participants has grown from 3 in the 2003-2004 academic year to 153 students in 2017-2018 in the Pskov, Yaroslavl and Moscow regions. This help is much needed since only 4% of orphans graduating from high schools in Russia are accepted to colleges. These children often lack the financial support, guidance, motivation, and self assurance needed to pursue the college education in order to improve their prospects in life. We are proud that foundations from Austria, Holland, and Norway used the RCWS model of the scholarship program and started to assist other orphans in Pskov region, who are eager to continue their education and receive a college diploma & profession, expanding the total number of students. The 53rd Annual Petroushka Ball took place on February 9th 2018 at the legendary Plaza Hotel and featured an exclusive performance by Ildar Abdrazakov, bass and Lyubov Petrova, soprano, who appeared by kind permission of the Metropolitan Opera. ANASTASIA The Musical on Broadway featured Stephanie Rothenberg. Over 700 guests attended the Ball this year. The Petroushka Ball is the primary fundraising event for the Russian Children’s Welfare Society (RCWS). Since its inception in 1965, the Petroushka Ball has been one of the most vibrant and important Russian-American events in New York. The Ball is a strictly black tie soiree attended by over 700 guests representing business, artistic and diplomatic spheres. Past Petroushka Ball events have featured leading soloists of the Metropolitan Opera, the American Ballet Theatre, New York City Ballet, Bolshoi Theater, and other prominent companies. One of the Petroushka Ball unique features is two distinguished orchestras – The Lester Lanin Orchestra in the Grand Ballroom coupled with the Barynya Balalaika Orchestra in the Terrace Room playing a boisterous set of popular Russian gypsy music, Cossack songs, and lively balalaika arrangements to the early hours of the morning. We would like to thank the following Sponsors and Supporters: Access Industries, Aeroflot-Russian Airlines, Blavatnik Family Foundation, Countess Tatiana Bobrinskoy, Svetlana Afanasiev, BleuStorm Vodka, Charles Krause, Susan Carmel Lehrman, Clé de Peau Beauté, Confident Care Corp., Dr. Andrei Dukhin, Elke Geacintov, Gourmanoff, Eric and Olga Jorgensen, Loeb Partners Corporation, Love Caviar Club, Elena Orlukova, Peter Picard, John Pouschine, Steinway & Sons, Peter Tcherepnine, Valerio 888. Special thanks to our Benefactors: Susan and Susan Crane, Peter and Natalia Derby, Dr. Theodore Diktaban, Andrew and Blake Foote, Dr. Natalya Fazylova, Maxim Izmailov, Joseph McAlinden and Olena Molotova, Thomas and Ellen McPartland, NetCost Market, Palais des Thés, Dr. Irina Pankova, Dmitry Sholokhov, Alexander Slepnev, Alex Soldier, Radiance Aesthetics & Wellness, Russian Samovar, WarmPalate. All net proceeds from the 53rd Petroushka Ball will be directed towards RCWS's charitable programs. This past December, over 1,100 children traveled great distances to participate in the 18th annual Yelka (Christmas Tree) celebration at the Teatrium on Serpukhovka in Moscow and see the holiday show “Sword of Samurai” and to receive a gift.